Paul over at TeleRead finally beat me to something today. He got an email from one publisher that tipped him to a new Kindle ebook format. Alongside Kindle (AZW) and Kindle (Topaz), Amazon now sell "print replica" ebooks. This is a completely new format and you need to update to the latest version of K4PC in order to use it. (It's also US only, darnit.) If you read the help pages, it sounds like Amazon have created a format that is something like PDF. Also, look at the toolbar that I copied from K4PC. It looks a lot like most PDF tool bars I've seen. Yes, I have one of these ebooks (and yes, I found a way to fix my broken copy of K4PC). It seems to use a different suffix (AZW4) than my other Kindle ebooks. I would take it apart but that's a little beyond my abilities.The file has about 150 pages (counting the cover) long and 10.8MB in size. Update: I've been told that publishers submit a PDF for this format. My source is also pretty sure that this is nothing more than a wrapper for the PDF, but he's not sure. I tried to rename it as a PDF and Adobe couldn't make heads or tails of it. Oh, and I just noticed that it actually notes the cover by name as well as the front matter (numbered i-xvi). That is most definitely new and strongly suggests that this is somehow based on PDF (or some other fixed layout format). BTW, before you buy a print replica ebook, keep in mind that it requires the latest version of Kindle for PC\OSX. That means that the DRM is very likely unbroken (at the moment). So far as I can tell, the new Kindle Print Replica format (KPR) appears to be a full featured format. It has all of the same annotation options as the other Kindle formats (highlights, notes, copy, etc). It can also use the dictionary/Google/Wikipedia search option. And it also seems to be mostly concentrated in textbooks and technical manuals. At least, I'm pretty sure KPR are all textbooks; there's no one single listing so I'm not sure. Here's a Google search that will help you find some if you like. Huh. I guess this means that fixed layout formats (like PDF or KPR) have won in academia. And I mean they really won; this new format is Amazon's concession that reflowable content just isn't usable for some textbooks. But I'm not surprised; I've seen far too many PDFs with complex content that simply could not be shown in any other format. And this new format also means that Amazon upset the textbook market again. Forget digital textbook rentals; they're just ebooks sold under a different contract. No, this new format means Amazon can now go after all the science and math textbooks that they couldn't sell before. And that is going to make things interesting. Google eBookstore about to go International? You have totally missed the point here. This is more evidence for an Amazon tablet. They’ve seen that Google Books PDFs (and especially Internet Archive PDFs that embed JPEG2000) really require a lot of CPU muscle. So my guess is that they’ve found a way to do such PDFs with a way that requires far less CPU that wouldn’t make them a huge PITA to read on their tablet. Unless the AmTab is going to run Win7 I don’t see how this matters. Now, if you could use this format on the Android app then you would be right. But you can’t. Yet. The word you left out is yet. You expect them to show their hand before the hardware or let other tablets have it first — if at all? And you want something weirder? Why did HP say webOS will still be developed when there is no one licensing it? Maybe someone has and they can’t say. And what if that’s Amazon? Cue Twilight Zone Rumor Music. I can’t wait for someone to dissect this new Kindle file format and tell us what it’s made of. Keep on it. HP is still going to be using WebOS themselves. They bought out Palm to use WebOS in *three* product lines: cellphones, tablets, and *printers*. They discontinued the first two but not the third, which is one of the corporate cash cows. Obviously if somebody wants to dump cash on them to “experiment” with WebOS devices they’ll take it, but the development costs of preserving WebOS as a printer app platform are trival for them. I totally agree with Mike Cane! It’s a prelude to the realease of an AmTab. 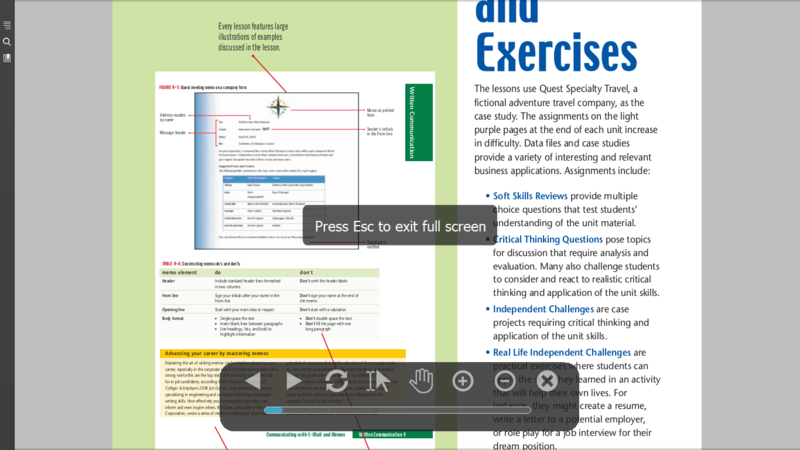 Ideal for reading textbook and technical material natively with annotations, etc. – a void that is yet to be filled appropriately. The Print Replica is indeed a PDF wrapped in a PDB format file, like Mobipocket is HTML in such a wrapper. There are also some interesting, but currently obscure data sections separate from the PDF. It may be that more than one PDF file can be included. For drm-free Print Replica ebooks (e.g. sample files) there’s now a tool to extract the PDF from the Print Replica ebook. Then again, why reinvent the wheel? I could see the wrapper containing dual pdfs, one optimized for 6″ screens and one for larger dispays. It suggests that Amazon really doesn’t care about formats, just DRM and wrappers, and that azw3 could in fact be an obscured epub3 if necessary. Not very religious, are they? Anyone on Mac OS X 10.5/10.6/10.7 with some Print Replica ebooks (and/or Kindle/Mobipocket ebooks) might be interested in my updated Quick Look plug-in that I’ve just updated to also display covers of Print Replica ebooks. It’s a great move on Amazon’s part. Like library loans, this is something I didn’t suspect. I can only hope they move quickly to allow any publisher who wants to submit titles as PDFs. I could give them about a dozen titles within a week. And of course, to be a real Kindle format, it has to display on recent Kindle hardware. My hunch is that the same hardware upgrade that brings library loans to Kindles will bring Print Replica to the Kindle DX and Kindle 3.